My first experience with a Regius Cigar was about a month back when I smoked and reviewed their Black Label Robusto. I thought it was a fantastic cigar. Today I am reviewing their new release, the Exclusivo U.S.A. Fat Perfecto. The Exclusivo U.S.A.line is specifically blended for the the U.S. market. Let's check it out and see how they did. This Fat Perfecto measures out at 5 ¾ x 60 x 54 with a nice pig tail cap. The Colorado Claro colored wrapper is nice, it's seamless and nearly vein free. From the cold foot there is a light spicy aroma while the free draw has bolder sweet notes of spice and fruit. After toasting the cigar, the first medium bodied puffs had flavors of toasted cashews and leather. As the sharp burn line moved up the cigar an oil line developed and the strength began to build. I also found other flavors of oak, lots of caramel, brown sugar leather and and hints of cocoa. As the burn reached the mid point the strength moved into the full bodied range. 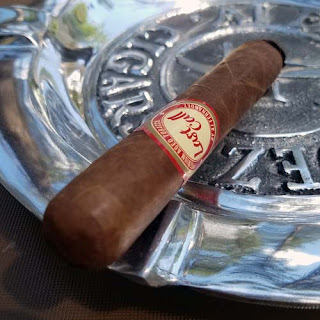 After fifty-five minutes the Fat Perfecto finished with nuances of caramel, white pepper and coffee while leaving behind a sweet leather aftertaste. Overall I thought this Exclusivo U.S.A. Fat Perfecto was another great cigar from Regius Cigars. It had a nice burn, a good smoking time and the flavor mix was superb. So far their cigars are impressive. If you get a chance to smoke one, or more, don't pass it up!